The best thing in life (and in art) is that pleasantly unexpected events can take place once in a while. I would never have thought, for instance, that a short film on felt-making can create such spiritual excitement in me, could fascinate me and make me smile: so it does what a work of art is made for. Already the opening credits forecast the high standard and the playfulness that later become the major characteristics of the film. The title Szelíd szálakon reveals itself from behind the thread of wool, while the subtitle (About felt-making…) is written on the screen by a pixilated ?photo hand”, and there are a lot of shifts of focus between the letters and the layers of threads. We will often meet the animated (but not drawn!) hand later on: it pulls down the forthcoming image just like a blind – a brilliant idea of sequencing. Since the film provides the fireworks of film-making means, it is worth while taking a closer look at them. 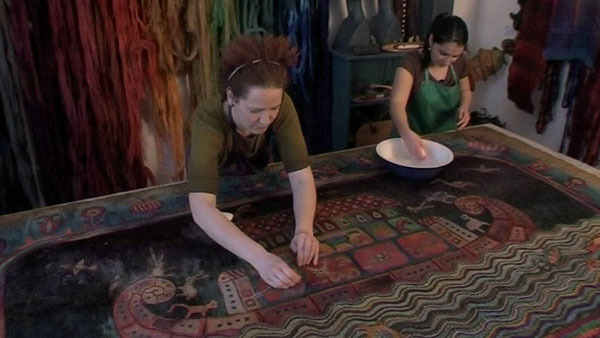 Judit Pócs makes felt carpets. ?I have to think backwards. I have to place the sample element to the bottom that I would love to see at the top as a result”, she says. How can this be shown in the most perfect way? Of course, through a table of glass photographed from the bottom. It is as easy as the ABC. You only have to think about it. This is the way the film is organized: by always finding the most appropriate solutions. Fireworks here are not only for the sake of entertainment, they are a spectacle for their own sake. They reveal something important about the world. Could felt-making be such an important thing? This, and many others, too. What we may have forgotten, the creators will make us remember yet again: it is a joy to learn new things! (Such as the fact that the lanolin soap of our childhood was made from yolk, since lanolin itself is yolk.) ?Felt is a wool-based fabric”, but we have known that before. However, the details are not that obvious for most of us: ?Card wool is clotted without any binding material, if affected by moisture, heat and tempering. 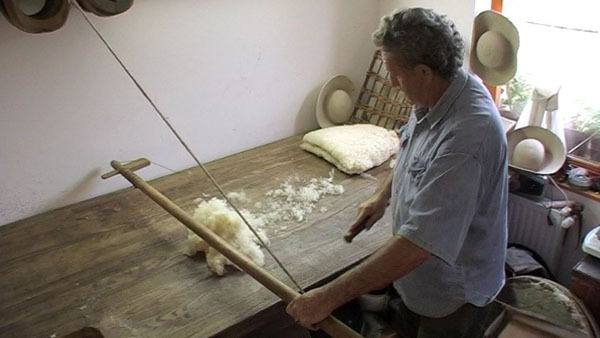 Felt is actually tangled, compressed animal fur.” The introductory eight minutes lead us along the process of wool thread making: from the lamb to the felt (sheep shearing, wool washing and coloring, carding or loosing). These steps are done by craftsmen in Hungary and Italy. On the map a ball rolls from one point to another; this tiny animation introduces the Italian shooting. 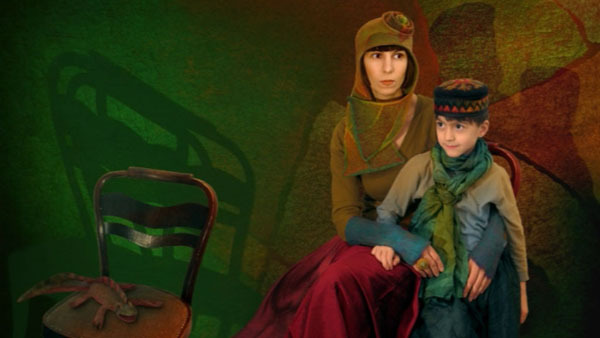 We do not only see the activities, but also learn the names of the Armeno sheep breeders (?our Italian friends”) and the Hungarian wool processors, as well as those of hat-makers – which shows the film-makers’ highly loveable attitude: they wanted to create a personal, humanistic atmosphere. What have we heard? ?The wool … is clotted without any binding material.” Where can it happen just like that, without any human contribution? Only where a lot of animals are kept at one place. Since ?felt-making is one of the most ancient methods of textile making”, legend has it that the first felt carpet was created on Noah’s arc from fallen pieces of fur. The place was wet and warm, and tempering was done by the herded animals in the form of trampling. 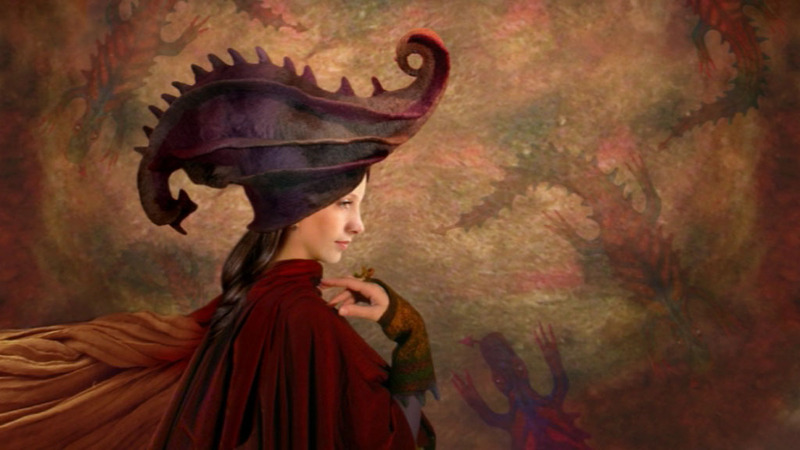 The animated film we see in the meantime is not mere illustration. Here the image of a living sheep is transformed into an animated lamb, as the animals walk onto the arc. 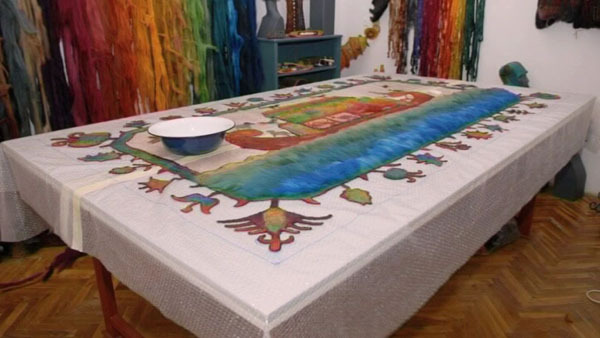 In the closing phase of the ?scene” (when the narrator talks about the first, spontaneously made felt carpet), Noah’s arc, floating on the sea, becomes the central motive of a carpet with a frame. We are happy to recognize later that this part of the introduction returns in a different form and takes on a meaning. 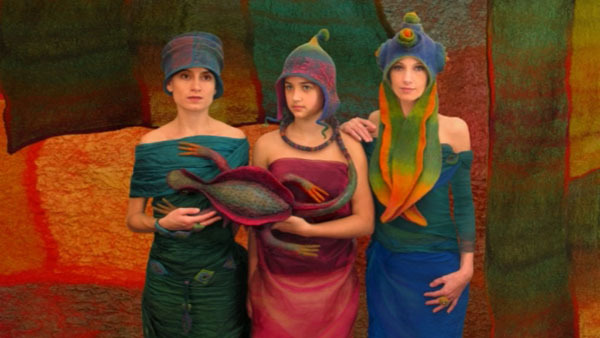 When the thread of wool is ready, an animated ram takes us through the process of felt-making, kicking the chalk and the scissors to the table, where Judit Pócs will soon use them to cut out the felt animal figures ?who” are to become the passengers of the arc. Because, as I earlier said, she made carpets. 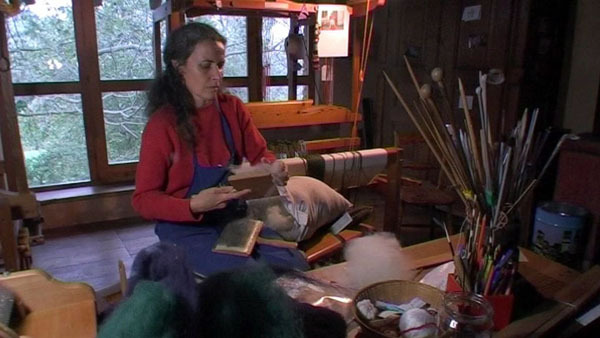 She makes the layers of card wool, sprinkles them with warm soapy water, rolls them, then mills and tempers the felt. She is not alone: to temper the oversized carpet, she needs two or three men. ?We compress the material by trampling”: it looks as if they were dancing to the brilliant traditional music of Zoltán Krulik and Makám that gives the musical accompaniment of the whole film. Tempering is a tough physical work, yet as it is done by Judit Pócs (and her partners), it looks easy, almost as if choreographed. 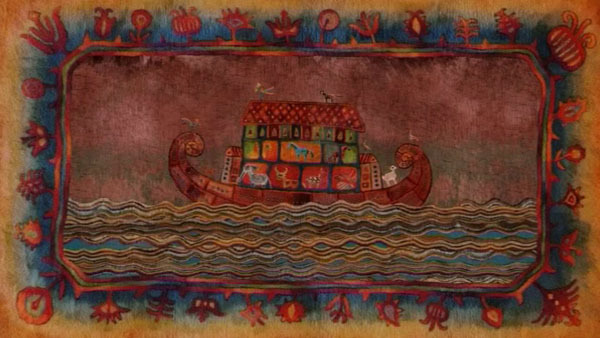 The end result is beautiful: the sea, the arc and the animals in a charming and decorative unity, a lá naïve art. The epochal starting point of the genesis of felt-making becomes the end point right in front of us. We can also see the closing image of the initial animated film here on the carpet: such refined internal rhymes appear throughout the film. The felt animals she cut out start walking up and down on Judit Pócs’s working table, while she is working: the creator and her creatures. 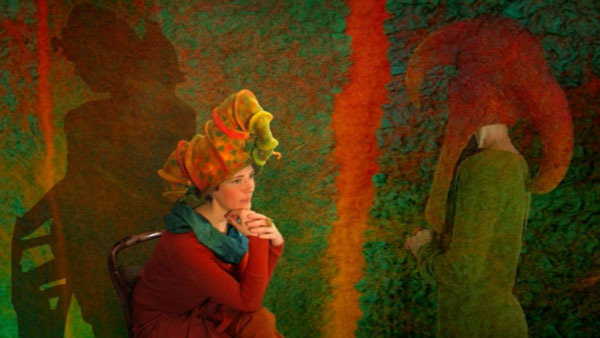 Following the carpet, a wonderful scarf, a hat and an animated statue are prepared of felt in Judit Pócs’s one-man workshop, all radiating an original perspective. Of course, the fabric of the scarf is pure wool, this will be turned into felt with the silk, by shrinking and making it slightly leader-like. She needs to be careful, however: ?I heat up the water and increase power gradually, because if I work with too much intensity in the beginning, the wool would turn into felt on its own, and would ?cast off” the silk.” We feel the greatness of expertise here. Moreover, we somehow also sense that we always understand (almost) everything. Just as it is expected from a good educational film. And Szelíd szálakon is one of them indeed, although in a bit different way, as I have been trying to explain for a while. By the time we reach the lizard as an ?animal statue”, we are absolutely familiar with the working phases, and we can finally concentrate on the aesthetics of the trade. By now we are so fascinated with the film that we look at this simple activity as poetry. Judit Pócs pulls the template out of the almost completed lizard through its mouth. We suddenly recall the mouthbrooder fish and that the excess leaves through the mouth. It is something that cannot really be interpreted, just like poetry. To a certain extent, we are in an animated film: the completed lizard will move, even climb on the wall. What else could we call an art film, if not this one? 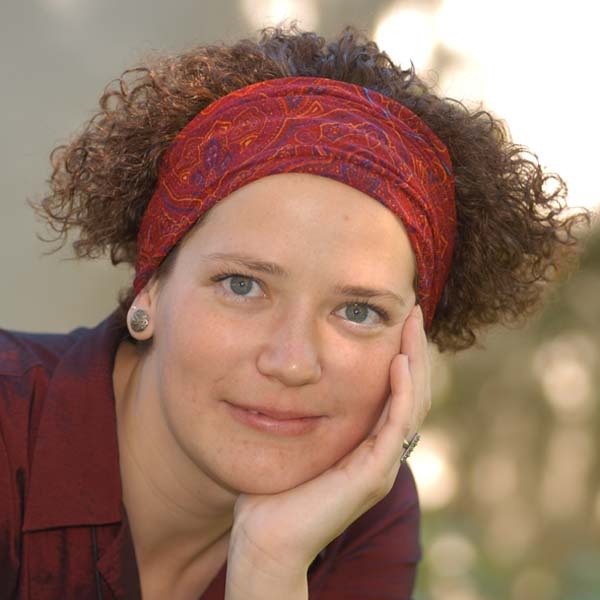 Judit Pócs is the ?main character”, the script-writer, one of the narrators and the co-director of this film. She portrays and is being portrayed at the same time. But let us not forget about her co-director, the fine artist and film-maker István Rittgasser, who is her equal partner as the photographer and editor of the film. In their joint creation, we find the answer to our question: apart from felt-making, what other important things can they show us from the world? Well, all these. The praise of sensible human work. The adjective ?human” was not put into the title as to distinguish it from animal work (actually, there is such a thing: spiders, ants and beavers could speak about it), but I wanted to emphasize the humane standpoint that is represented by the creators. 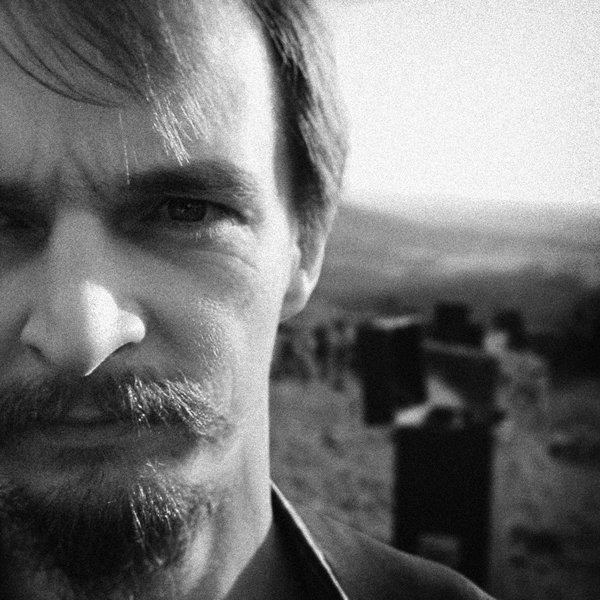 Szelíd szálakon – which is partly an educational, partly an animated fine art film, a portrait, but also a playful (almost) philosophical essay about work, about art, and about man as a sensible, creative and active human being – won the award of Filmkultúra at this year’s Animated Film Festival in Kecskemét.